Another sad day for Scottish motor sport. Bill Henderson has passed away at the age of 92. Many of you won't know the name or the man, but he was an influential figure on a certain young motor sport writer's early 'career'. In 1972 this youngster had a 'day job' with Shell Petroleum in Glasgow and a weekend job with 'Scottish Motor News & Advertiser' photographing and reporting on rallies, and was subsequently asked to go to Ingliston and cover motor racing. This fledgling reporter and photographer duly turned up at the Edinburgh circuit as a pure dead gallus representative of a weekly newspaper. Some folk took exception to this upstart from central Lanarkshire, but there were two chaps who were patient, kind and tolerant. One of them was Bill. He was instantly recognisable with his bunnet, handlebar moustache, tweed jacket and Leica 35mm camera. Aspiring journalists looked up to Bill. He was already very well established in the game and had a vast number of friends and influential connections. He was highly respected and well liked. He had been photographing and reporting on motor racing for 20 years for the weekly 'Autosport' magazine when this precocious novice turned up representing a 'quality' weekly newspaper - which was given out free at filling stations! Bill presented a rather austere looking fellow in those days as he went about his business with serious intensity, but that was a bit of an act. Above those rosy cheeks, were a pair of twinkly eyes that always had a glint in them. Interest? Mischief? Both for sure. He never actually told me or instructed me what to do or how to behave, he merely offered suggestions and encouragement. In retrospect a much more effective way of educating a newcomer without talking down to them or preaching at them. 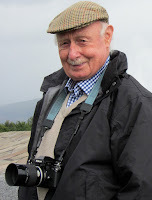 He was positively charming and always had a nice wee story to tell and would listen avidly to others' tales. He wasn't a bloke or a guy. He was a gent. A true gent. A proper gent. I got to know him quite well through the late 70s and early 80s when I started contributing to 'Motoring News' (as it then was) who switched me from rallying to racing which meant I would meet Bill regularly at race meetings and hillclimbs before I was switched back to rallying. Thereafter I saw him less frequently, but would occasionally bump into him in a forest on the Scottish Rally. Not only was he an excellent writer and photographer, he was a gifted artist. There are many homes around Scotland and further afield with paintings in studies and offices, or above the mantelpiece in living rooms proudly displaying examples of Bill's work. Mostly cars, cherished cars, racing cars and historics, but always meticulous and evocative representations of the subject. That should come as no surprise as he originally studied at Glasgow School of Art and subsequently became an art teacher as his 'day job'. He was introduced to motor sport at the original Bo'Ness Hilliclimb in 1946 and that opened up a whole new passion, photographing racing cars and the personalities of the time. He was one of the original contributors to 'Autosport' magazine founded in 1950 and was recognised with an award from the magazine in the year 2000 to commemorate 50 years of reporting and photographing Scottish motor sport. And he didn't stop then. His last event was the revived Bo'Ness Hillclimb which he attended in 2014 at the age of 90. The sport has not only lost a wonderful recorder of events and exploits, but a kind, charming, generous and proper gent. The funeral will be held on Monday 7th November at 11.30am in Camelon Crematorium, Dorrator Rd, Falkirk FK2 7YJ. The service will be followed by a burial ceremony in the nearby cemetery.